but I`ve never heard anyone in the aerial trade refer to it by this moniker. “That`s a tight fit missus”. actually on Emley Moor ! View of Crosspool transmitter looking NE from Ringinglow. 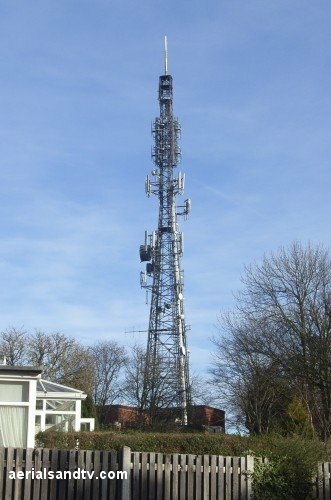 The television TX is one the right of the two masts on Tapton Hill. Close examination of the picture will reveal Drax power station on the horizon (to the left of the TX) and that`s nearly forty miles away ! 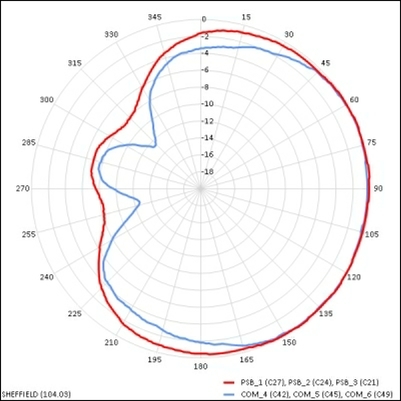 It can be seen from the graph that the three PSB MUXES can still be received on an A group aerial. 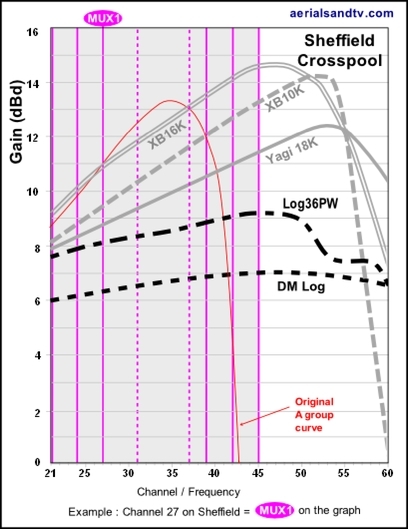 Crosspool is vertically polarised and is a repeater (or relay) off Emley Moor, that is to say it receives its signal from the latter then rebroadcasts it. Since digital switchover Sheffield has been - effectively - a K group, or wideband. When (just) analogue was being transmitted it was originally an A group. Those in weak signal areas are better off with a K group (e.g. our XB10K) as it will work better than a wideband, see Sheffield`s graph. Note that the main three PSB MUXES are receivable on an original A group aerial. DSO at Sheffield occurred in Aug 2011. Sheffield television transmitter (sometimes known as Crosspool) was opened in 1967 and is possibly the one used by most customers around Sheffield. Unsurprisingly the tower can be seen from much of the City as it was erected where it could (re)broadcast to the greatest area on "line of sight". Its exact location is off Lydgate lane and it is next to a Police TX mast. The height is 52m and the RSJ spaceframe construction it is similar to many others all over the country, which is unsurprising because it was a standardised design, a BICC type 152 to be precise. It was built by British Insulated Callender`s Cables (or B.I.C.C) who were responsible for much of the infrastructure built in this country from 1945 up to the 1980s. The company is still going but now but called Balfour Beatty. 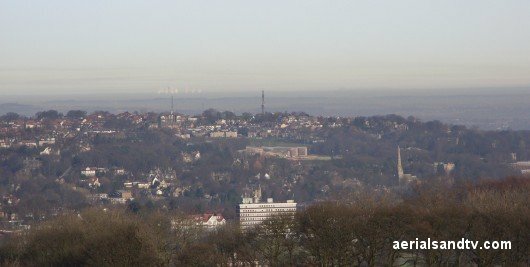 Ofcom quote Sheffield`s maximum population coverage as being nearly three quarters of a million, but that includes households which may well be on another transmitter with overlapping coverage. 700MHz clearance is due at Crosspool in Q1 2020, but there will be no change (excl MUXES 7 & 8 which are actually due to be switched off ! ), and the “Local” channel moving from 55 to 35. Note how the transmitter puts out more power to the east, and how the pre DSO restriction to the SSW is no longer present. Radiation pattern graphic courtesy of Mike Dimmick. 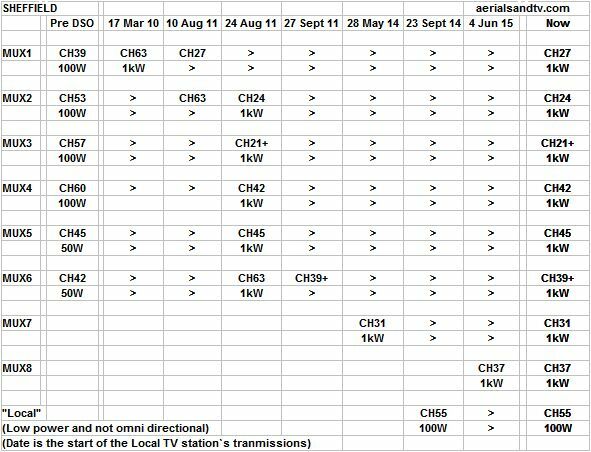 For Sheffield`s frequencies see its channel allocation guide. This also includes the same information for other transmitters receivable within Sheffield`s coverage area and this can be very useful for identifying alternative transmitters. The Channel Allocation Guides can be very useful in the diagnosis of co-channel interference problems and can also be invaluable if you are trying to find a spare channel for a modulated output (e.g. for a Sky box or CCTV system) to be added to your TV setup/distribution system without suffering from co-channel. There is one ”Local” MUX allocated to Sheffield, CH55, which is more or less within the K group. It has been used for the “Sheffield Live TV” (a local station) since the 23 Sept 2014. Due to co-channel issues with Oughtibridge, Wincobank, Dronfield and Stanton Moor, it will only be transmitted to the east and SE. 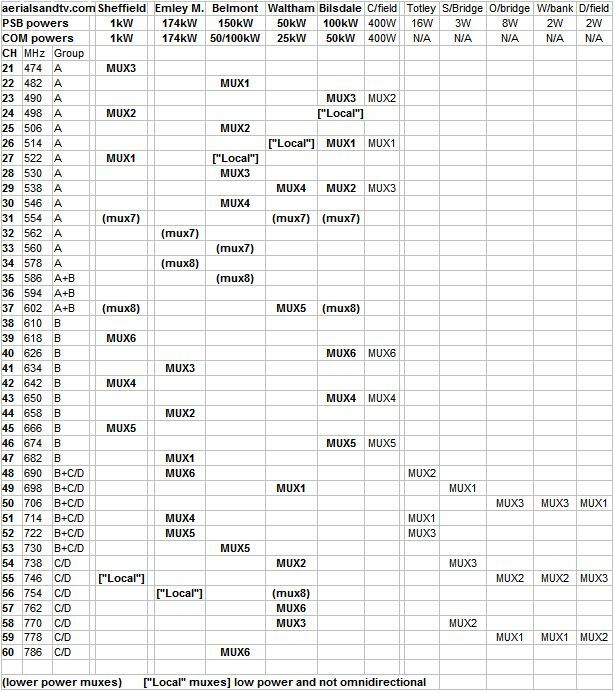 In addition, there are two HD MUXES (in the CH 31 to 37 gap) on CHs 31 and 37. All of these possible channels will be receivable on a K group (or wideband) aerial. For Sheffield we recommend the DM log for strong signal areas, the Log36 for medium signal areas, and the Yagi18K or XB10K for poor signal areas, the latter aerial being particularly well suited to loft mounting. The XB16K is for those with the most marginal signals. The dimensions and test performance of the aerials can be found on the relevant tables.